Discover a new article in this Hub about IoT Stack ! Following the previous “IoT Technologies” blog, here is the latest update on the IoT Stack and why it will structure itself in 6 layers. At the time this book was written, the current landscape of standardization groups, associations, and organizations is still being influenced by the different stakeholders. Standards are a core component of not only the success of the IoT as a trend, but more importantly as a weapon for companies to win the speed war of time to market. An important aspect of standardization when focusing on analog companies wanting to move their current product portfolio to the IoT space is to understand that neither the IETF, nor the IEEE, run certification programs. This very often causes challenges for vendors and manufacturers who want to get official recognition that their products comply with any of the standards released by both organizations. Other organizations leverage the defined standards from IEEE and IETF to create certification programs. IEEE Conformity Assessment Program (ICAP) falls into this category. ICAP is not a Test Laboratory but will partner with industry leading test laboratories to deliver robust conformity assessment programs. 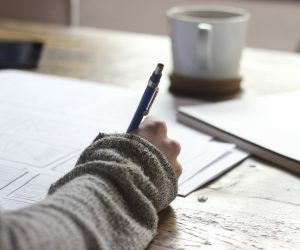 Another example is the Wi-Fi Alliance that was formed in 1999 to certify Wi-Fi products indicating that they have met industry-agreed standards for interoperability, security, and a range of application specific protocols. Very often application, network range, network topology, power source and throughout drive those other organizations to publish their own IoT “implementation” of those standards. The internet of things will change the rules of the game and will change the basis of competition in the manufacturing space. Today’s manufacturers that want to strategize their IoT approach will need to choose where they will want to play and compete. Moving an existing analog portfolio into an IoT compatible offer by leveraging the IT layered architecture framework is an important step into digitization. Current analog manufacturers are becoming aware of the fact that they need to make their current portfolio more IoT compatible and this will push them to choose their battles knowing which rules apply for which layer (hardware, software, and services). Some players will want to play only in one layer (sensors providers, gateways manufacturers, and platform providers) while others might choose to provide end-to-end solutions. Some IoT supplies will choose to play on a single layer and therefore go for the high-volume, low-cost approach. Others will choose to implement specific added value functions or services enabling them to go for lower volume with higher customization and therefore avoiding the communization war. 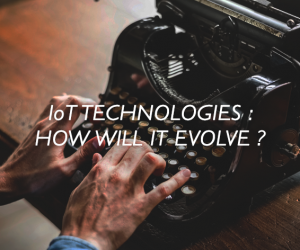 In this chapter, we are proposing a simple way to understand the future state of the IoT and how it will structure itself to move an existing analog portfolio into an IoT compatible offer. One critical challenge, for the analog manufacturers, once they understand where they fit in the overall IoT architecture, will be to find ways to create and capture value. The value will shift from Products to systems, from Systems to Data, from Data to Knowledge, From Knowledge to Services. 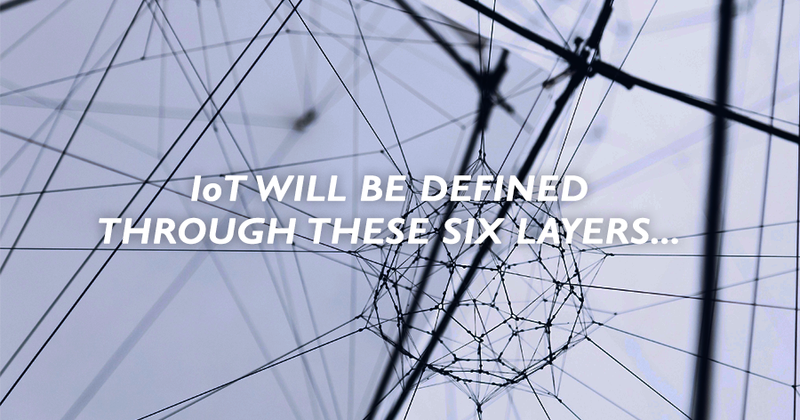 Therefore, one who wants to leverage the IoT to transform its core analog offering needs to understand the 6-layers architecture. Due to the complexity of the IoT environment, which is worldwide, it’s necessary to look at it from a high level and understand the various layers of which it is comprised. 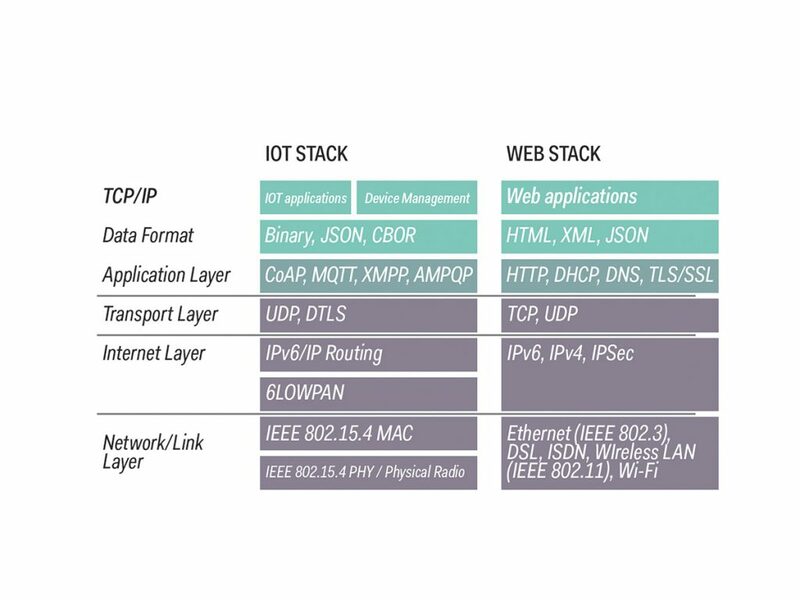 There might be one “standard IoT” stack; there might be several co-existing (as described above); nevertheless, IoT will structure itself into layers very like the OSI model and with adaptation needed to cope with IoT needs, constraints and usages. The need for interoperability will see an increasing market evolve around IoT Labs, facilities or IoT testbeds. We consider that there will be mainly 6 layers; each of these layers contains distinct technology, software and devices which is a mix of legacy and more advanced hardware and software. 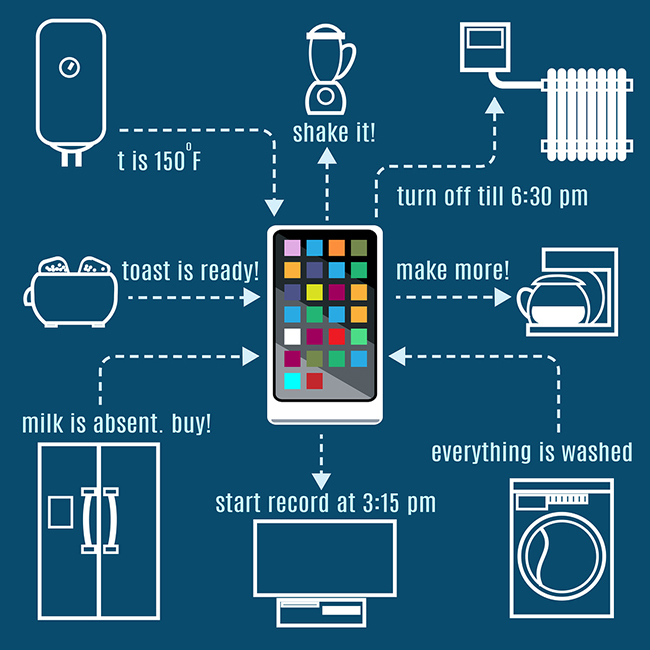 Layering the IoT enables people to easily understand where a technology or a product sits. What guides our thoughts are the same principals used to determine the seven layers in the OSI Reference Model. The OSI principals are the followings. Keep the engineering simple by limiting the number of layers. Minimize the interactions between layers. Ensure each layer addresses different functions. Group functions that perform similar tasks into the same layer. Design functions in each layer to be able to redesign them without impacting other layers. IoT users Access and Applications. IoT Networks (wired and wireless). Pre-order the IoT Book ‘Digitize Or Die’ HERE & LEARN MORE about IoT Stack ! IoT Technologies : How will it evolve ? 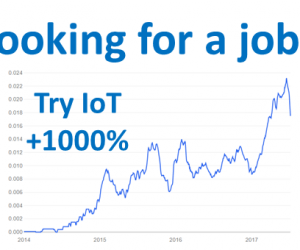 Looking for a Job: Why should you try Internet of Things ?